Mary Lee Fitzhugh Custis was an Episcopal lay leader in Alexandria County. The daughter of William Fitzhugh a member of the Continental Congress, and Ann Bolling Randolph Fitzhugh, Mary Lee was most likely born at Chatham, in Stafford County, Virginia. On July 7, 1804, she married George Washington Parke Custis, an orator, playwright, writer, and the grandson of Martha Custis Washington through her first marriage to Daniel Parke Custis. " Molly " Custis thus became George Washington's step-granddaughter-in-law. Molly's father William Fitzhugh and George Washington were long-time friends, with Washington mentioning in his diaries the hospitality of Molly's mother Ann Bolling Randolph Fitzhugh; a visit to William Fitzhugh turned out to be the last time Washington left Mt. Vernon before his death. 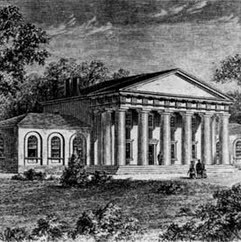 The Custises lived at Arlington, an 1,100-acre plantation in Alexandria County, Virginia. Of their four daughters, only Mary Anna Randolph Custis, who later married Robert E. Lee, survived childhood; Lee's father Henry had famously eulogized President Washington at the 1799 funeral.